Guest blogger Todd McPhetridge is a photographer with considerable experience in art publishing. In part 1 of his guest article, he offers insight and advice for other artists. Do you have what it takes to work with an art publisher? So you’re considering working with an art publisher? Grab a cup of coffee, settle in and let’s talk about the pros and cons. I was signed by Winn Devon in the Spring of 2010 and it has been a wonderful experience for me. As long as you go into art publishing with clear expectations, I don’t think you will be disappointed with your experience, especially if you work with a top art publisher. There are many pieces of the art puzzle that need to come together for you to have a long and successful career. Putting that plan together is the fun part, or at least for me it is. Defining success early in your career will help you establish goals and strategies. If money is your definition of success then you’ve got it all wrong and we can’t be friends. Only kidding! Hey, we all have bills to pay and why not pay yours selling art, right? 😉 If money truly is your end goal, you will want to study what has and hasn’t worked for other artists. I have personally found Maria Brophy’s candor absolutely refreshing and raw. Her husband Drew is a talented surf artist and someone you should truly get to know. You can read about their successes and failures on her art business blog. You will need to consider all angles when it comes to art publishing, the negatives and the positives. Some art publishers don’t want you to use other fulfillment services like Zazzle, RedBubble, Fine Art America or Image Kind. That is a choice you will have to decide whether or not you can live with or maybe it’s a negotiating point for you. When I first started researching whether art publishing was for me or not, I picked up a copy of Barney Davey’s “How to profit from the art print market”, and read his blog Art Print Issues. I also read “I’d rather be in the studio” by Alyson B. Stanfield. 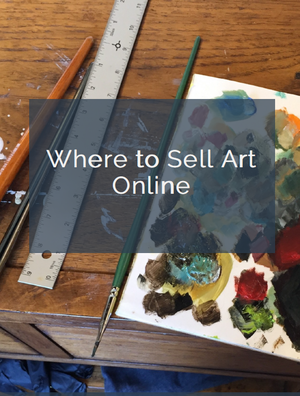 Her Art Biz Coach blog is a great art business resource. Those two books without a doubt really kicked my mind into hyper drive. Finding your path with art is all about asking yourself the right questions. When approaching an art publisher you will want to show them a consistent style and have a series of work. When creating art think in terms of sets and how other pieces in the same body of work will flow with that series. I have a distinct color style that I apply to all of my images and I keep my black and white and sepia prints all within the same style as well. Experimenting is fine, but when I am submitting new work, I want to keep it close to what has worked well for me in the past so that any new prints are seamless with my previous work. You will also want to consider subject matter. Sure you may love painting tarantulas and there may very well be a niche for that, but the general public and most art publishers aren’t into spiders. You most likely won’t have a say in what is published in the beginning. Some prints that I thought would do really well, have been completely passed over and to my amazement some of the ones that I thought were duds, have sold like crazy. Trust your art publisher, they are the professionals and have a good idea of what will sell and what won’t. Work with the best and don’t waste your time with anything less. Do your homework and find art publishers that are a good fit for you and your art. If you are turned down, don’t be discouraged, it just may not be a good fit for them at the time. It doesn’t mean that you won’t be able to do business together in the future. It’s the perfect opportunity to find out what you can do to improve yourself and your art. Rejection is never fun, but it does get easier over time. No matter what the situation is, I try to always reply with a kind “Thank you for the opportunity. What can I do to make my work more marketable in the future?” a lot of art publishers will be more than happy to give you a few gems of wisdom that will help you out later in your career. Hey, just because you were turned down the first time, don’t give up. When you come out with new work be sure to include your previous art publishing contacts. You never know when a golden opportunity will arise.